An example of the program (version 1.0.0). NOTE: I am SS111 on Minecraft Forums and anyone else claiming to have made this tool/to be me is lying. If you want to see the Minecraft Forums post, go here. Many people just can't seem to make a Minecraft server; Be it the startup script or the port forwarding. Also, having the entire summer to express my programming skills, I decided to make this. Sure, there are other ones out there, but I wanted to make one. 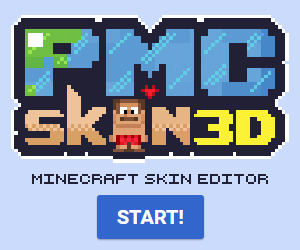 This does what the title implies: Makes you a Minecraft server with the click of a few buttons. Please note that this application is in alpha stage and does not yet have features such as a proprieties editor and an external mod loader. These features are planned and will eventually be implemented. I AM NOT providing help with UPNP. If the portforwarding fails/doesn't work, just go here to do it manually. NOTE: Don't run "EnableUPNP.exe" directly, or it won't fully enable UPNP. It has to be run through the application. In the "Run" dialog, type "services.msc" and click enter. If they are not started yet, start "UPnP Device Host" and "SSDP Discovery". Click Start and search for "cmd.exe". Right click it and select "Run as Administrator"
Type "netsh firewall set service type = upnp mode = enable" and click enter. Automatic port forwarding - You don't even need your router credentials! Automatic enabling of UPNP - Don't do any work so my program can port forward for you! It's all automatic! Support for Bukkit, FTB, Tekkit, Voltz, and vanilla Minecraft - Your server, your way. 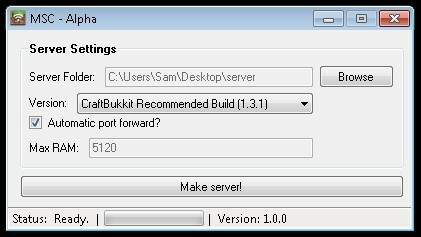 Always get the latest and greatest Bukkit recommended build - Don't wait for me to update the application each time a new one comes out! Automatic updates - When I release the latest and greatest updates, you get them also. Fluid and easy to use - Never make a server manually again! Run "MSC -Alpha.exe" and update to the latest version. Q: MSC -Alpha never stops generating files! A: You need to update to the latest version (1.0.4 address this issue). If that still doesn't help, run "gen.bat" while MSC -Alpha is generating files. Q: When I start my server I get "'java' is not recognized as an internal or external command operable program or batch file" in the console window! A: You either don't have the correct Java for your OS (Pick 32-bit or 64-bit, respectively based on your OS) or you need to set the PATH variable. Q: "[WARNING] Perhaps a server is already running on that port?" shows up in the console window! A: This means a Minecraft server is already up and running. Close all running servers and try again. Q: When I try to start my server, I get "Invalid argument: -d64"! A: This means that your computer is 64-bit but you don't have 64-bit Java. Install it or remove that "-d64" from your "Start Server.bat". Is your issue not listed here? Send me a message or post in the comments. If all you say is "It doesn't work!111!one!! ", I am not going to help you and will almost definitely delete the comment. Please be specific. I'm currently working on a new project for Bukkit: Remote administration via Android. If you wish to help and you are a developer, please contact me. I need help porting this to Mac and Linux. I need a YouTube video. Doing any of this will get you put in the credits! Has an error occurred? Like my program? How did I add (feature name here)? Post a comment or message me and I will try to get back to you. P.S. : Please give this a diamond if you like it! P.P.S: If you REALLY like this, I would like it so much if you donated. Merges DLLs into main application, adds support for the latest CB reccomended build, adds support updates Tekkit Lite support to 0.5.7, adds Voltz 1.0.11 support, and adds the long awaited FTB (ultimate and lite!) support! i have a problem, when i create the server it says to use my external Ip but i have to join with my Ipv4 address? I worked amazing before but now it don't work. Please help! Rextextureking, my bro's friend is raging because the server aint workin for him. He download .Net Framework 4. Plz help. DO A FRIGGIN CUSTOM JAR, IRONFIST! And how can i close all of these java files? Can i make 1.5.1 bukkit server with this program? can u run a tekkit server on it? also when you say an invisible server does that mean no one can acsess the server but me and the people on my internet connection? An "invisible server" means one you can't see. When MSC -Alpha generates files, it starts the server, but makes it invisible to you. When it ends the server, it ends the first instance of Java. So if you had Minecraft running when you made the server, it would have closed Minecraft instead of the server, leaving a server you can't see running. Once I press the Make A Server button, an error message comes up saying port forward failed, also something like "is the updp for both your computer and router enabled?" so i went to my router website thing and i can change a setting for attack detection for "TCP/UDP Port Scan" (which is enabled), should i change this?, is there any harm that can be done by not having this enabled? "I AM NOT providing help with UPNP. If the portforwarding fails/doesn't work, just go here to do it manually." I have been trying to make a server for months now. I decided to try this server creator and i'm glad i did. At first it didn't work for me, so i decided to email him for help. He not only helped me get the things that i needed to make a server, but also helped me through all the problems I encountered. 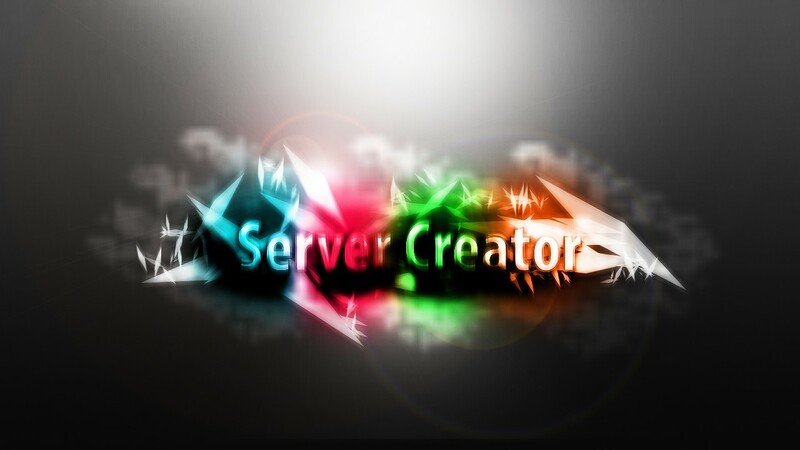 I would recommend this to anyone who has trouble creating servers.It does all the work for you. The best part is that it even makes modded servers. When I run the "Start Server" Batch file, it always says something about Java not being recognized as a batch file or something. Help me out? That means Java's path variable isn't set. You need to set the PATH variable. IT says failed to bind to port what does that mean? It isn't Start server bat its start server batch .... so i go on to it ''press any key to continue'' i press it it goes off. What do i do?! Then there is probably an error, such as "invalid argument." Does it say anything like that? The server folder is where you want the server to be "installed" to. Pick anything. does it make a bukkit server? Grab the latest version. It's fixed now. I'm working on it as you speak, actually. Well, I'm glad it works for some people! So it never stops generating files? Did you not even read the giant, red bold text saying I'm working on fixing the error? Never mind, that error is my fault. I will have it fixed soon! Is everything extracted into one folder? When I try to make a server at the begging, I dont know what to put for "SERVER FOLDER". Im confused. ???? Soon. Just use the Custom JAR option and download the 1.4.7 JAR manually. Funny thing is, I'm just in the process of adding Tekkit Lite and Minecraft 1.4.7 support. That should be released in a couple of days. If you want Minecraft 1.4.7, your going to need to use the Custom JAR option. I have tried the automatic version, I have followed the instructions you gave for doing it manually but still nothing, I tried to go to the link but I cannot find my router model, please if you have any idea what could be going wrong answer, if you do not want to answer becuase I am asking about the UPnP then just reply saying so. | somebody help this guy!